I wanted to like this book because I share some of Barbara’s attitudes toward health. Like her, I exercise for fun and even more for vanity. I eat what I want and forego medical screenings. Unfortunately, as other reviewers noted, the book turns into a rant that gets a little annoying. Overall the book suffers — on a larger scale — from the same flaw that undermined Bait and Switch. Ehrenreich takes a particular example from her own experience, generalizes, and editorializes. For example, Ehrenreich says that people in gyms work out alone, listening to their headphones, each in his or her own world. That may be true for some people in some gyms. I’ve belonged to gyms my entire adult life and they’ve always been a source of social life. But of course I don’t just walk into any gym; I choose one where I’ll feel comfortable, and I don’t go to the top-tier high-priced fitness clubs. I talk to the women — and men — in my classes and on the floor. Once you’re known around the weight room the trainers will joke around. A few times — admittedly rare — friendships develop that go beyond the gym. 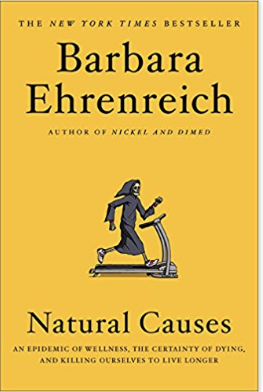 Ehrenreich also dismisses yoga and meditation. People of all ages practice yoga; I’m not crazy about it, but I see how it helps me enjoy aerobic dancing and weight-lifting more. As for meditation, she cites one meta-analysis that finds little evidence for the benefits. The best response to studies like this can be found in an article on Huffington Past 2/7/2014 by a physician named Robert H. Schneider. As he notes, many studies support meditation in general and Transcendental Meditation in particular (in full disclosure, I learned TM in 1975 and have practiced it for most of my life — and have been surprised at the benefits I personally experienced). The best parts of this book — the medical skepticism — can be found elsewhere, presented more clearly and more systematically. Read Gilbert Welch’s book, Overdiagnosed, Christiane Northrup’s Goddesses Never Age, and Ezekiel Emanuel’s article in the Atlantic, “I Want To Die At 75.” It’s a shame the publishers didn’t see fit to give us an index so we could see if any of these were mentioned. 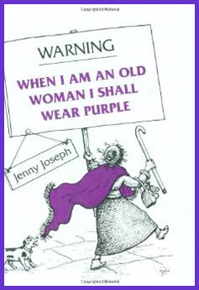 Northrup in particular would dispute Ehrenreich’s argument (p 167), “..Aging is above all an accumulation of disabilities…” Menopause is not a disability; many women sail through without medical assistance, especially if they exercise. Not all women have “knee and lower back pain” in their “forties and fifties.” And in my gym, we don’t mutter to each other, “It’s on — thing after another.” We’re too busy going to zumba classes. As she herself notes, the US Census Bureau “reports that nearly 40% of people aged sixty-five and older suffer from at least one disability…” That means just over 60% do *not* suffer those disabilities. 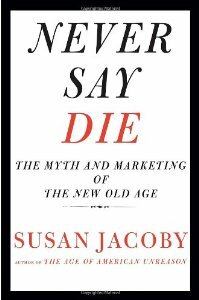 On p 166, she notes, “There are bright sides to aging, such as declines in ambition, competitiveness and lust.” The first two qualities support an unfortunate stereotype that reinforces the cruelty of age discrimination and keeps people out of the workplace. Does anyone think 70-year-old Hillary or 84-year-old Dianne (Feinstein) are lacking in ambition and competitiveness? Lust is none of our business, but I’d read Northrup’s book before assuming that the over-65 set doesn’t care anymore. Instead of expanding on this crucial point, Ehrenreich goes on to attack the bizarre promises of anti-aging products, including those proposed by celebrities. Yet this fear of a long, miserable span of helplessness, living at the mercy of caretakers (who are at best indifferent, at worst cruel and abusive) is the biggest concern of many people over 65. What’s missed is that it’s very difficult to hold off the “heroic interventions,” even with a proxy holding a signed document. For many people — those without children and those whose children aren’t up to the task — no advocate will be present. In the 21st century, there’s no reason not to store permissions in the cloud, so people could wear a tattoo or bracelet with a link to their final wishes. Her last paragraph, about facing death, is quite beautiful and I appreciated Berthold Brecht’s poem about dying. In summary, Ehrenreich is on the right track here but leaves lots of loose ends. However, I’m very happy to see a prominent author take on these issues and state uncomfortable truths. If we hear them enough, maybe we’ll see some action.